It's summer, even if our weather isn't acting like it! We spend our summers on Camano Island, WA- located about an hour North of Seattle. The place is so beautiful and relaxing! I can spend hours just looking out at the water and the mountains. My kids love to play on the beach...especially building forts with all the plentiful driftwood that washes up on the beach. Doesn't this look like a child's fort paradise?! My son sure thinks so! Built with lots of help from Papa! A very roomy fort, perfect for lots of friends and cousins! Don't let the outside deceive you. There are secret rooms inside and special spots to spy on people. This fort comes with a couch for sitting and/or a bed for resting! 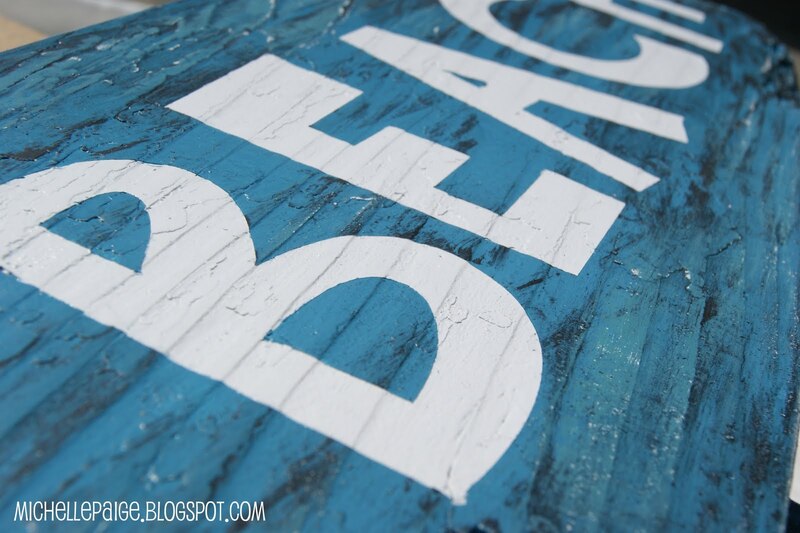 Look what treasure I found on the beach before my kids did...a weathered old sign! time for me to play, too! Click here to see how my sign turned out! Next time you're in town we'll have to look at a calendar - the boys have been BEGGING to visit! Loving the new look by the way - polka dots are super cute! Jacob must be having a blast!! Have a great summer on the Island!! I wonder about snakes! Any thoughts on dangers amongst that driftwood? Wondering about snakes! How safe is it amongst the driftwood? Very few snakes in WA State. Thankfully, we've never seen one on the beach or in the driftwood!